The game boots up to a nice title screen (seen above) accompanied by some cheesy tunes (luckily it's the only one in the game). The typical NHL/NHLPA and game developer credit screens follow, along with a demo of the game. Skipping to the menu screen, there are a ton of variations you can make. From exhibitions of All-Star teams to 11-48 game seasons to 3, 5 or 7 game playoffs, this game is definitely not lacking in the options department. This game has both the NHL and NHLPA licenses, so all the teams and players from the '95 season are in here, and all the teams have different stats according to their strengths and weaknesses. Control can be laid out to the preference of the player, and are pretty straight forward. By default, the C button performs a Low Shot/One Timer, the B button takes a High Shot/Closest and the A button does Passing/Checking and Turbo. The camera can be set to all sorts of different settings. Dynacam, Zoomcam and Setcam all provide various views on the action. Dynacam is the default and provides a good view of the action wherever the puck is on the ice. Period length can be set from 5-20 minutes in 5 minute intervals. Line Changes, Penalties and Offsides can all be set on or off, and you can even view your players skills and stats and set up the lines. All in all, it's a very complete hockey package. The game features play-by-play from Al Michaels, which is actually pretty well-done considering this game is on a cart. The calls keep right up with the action, and call out players by number (except for Hull, who is called by name), says all the team names and overall describes the action pretty well. Music consists of one poor title screen tune, and some in-game organ music. Otherwise, the music is non-existant, but it's not really missed when you're in and playing the game. Also, the crowd boos and cheers for the away/home teams as appropriate. Overall, a good job in the sound department. 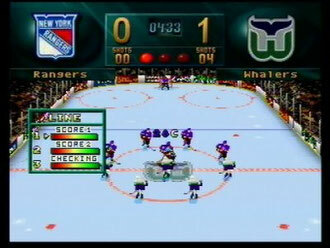 Graphically, the game itself consists of scaled/rotated sprites rather than the 3D modeled hockey games of today. What this means is blocky little hockey players on a blocky rink skating around in psuedo 3D fashion. The animation on the players is pretty good and for the time this would have stood up well against the SNES or Genesis hockey games of the time, but by today's standards it admittedly looks pretty weak. However, the menus and all the other static screens are sharp and well-done, adding to the overall presentation of the game, making it look that much more 'polished.' Along the boards, you'll find ads for a bunch of Jag games, including unreleased games such as Black Ice, White Noise and Charles Barkley Basketball - a nice touch. It's all in the gameplay, right? Well, luckily, Brett Hull Hockey does this pretty well. The controls are very intuitive, passing is easy to pull off and the A.I. isn't impossibly hard like in some of the other sports games out there. From the start of the game you can choose 1 of three lines per face-off such as Score 1, Score 2, Checking, Power Play 1 & 2, Penalty Kill 1 & 2 and more. The more you use certain lines, the more they get worn out, so keep an eye on the meter so you don't kill your players. 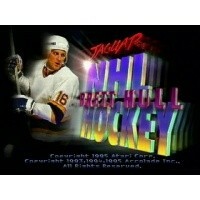 Considering this is the only hockey game ever made for the Jaguar, it definitely would make a great addition to the Jag's library of games. Brett Hull Hockey is a nice, complete package that is fun and good in the graphic and sound departments. This is one 'lost game' that's begging to find a home in everyone's Jags.